Half-full, half-empty, or ... ??? We could tackle the easy questions like why anything exists, or how one could know there is a God, but today we’re going all out. It’s time to solve the haunting dilemma: Is the glass half full or half empty??? I will offer you a set of choices. Half full: the glass is half-way full of the liquid. 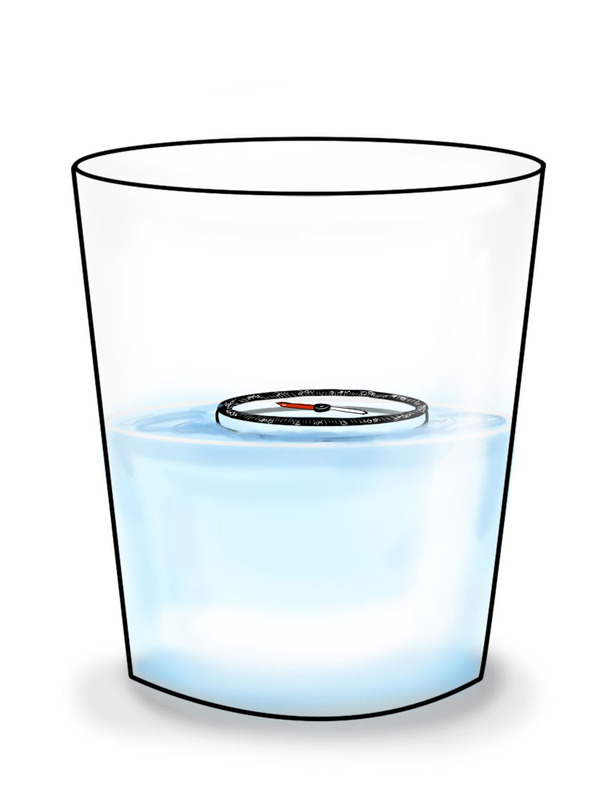 Half empty: the top half has no liquid, it’s empty up there. 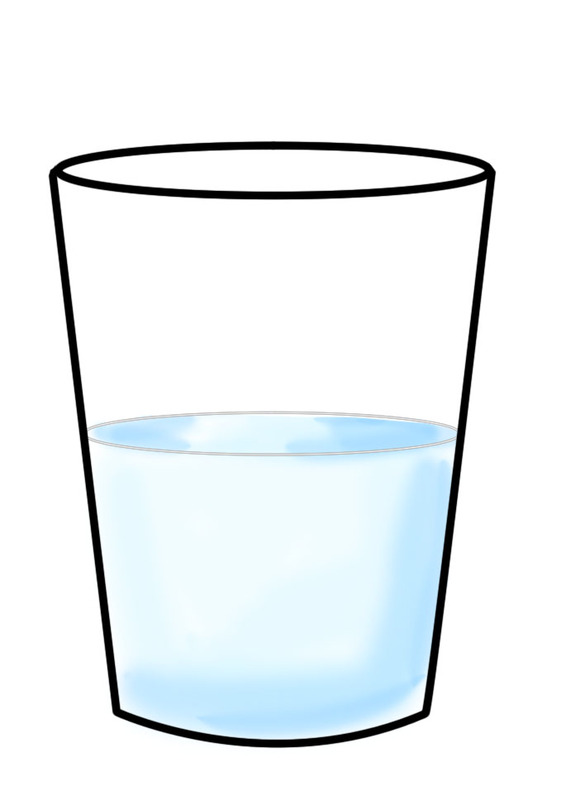 Full (#1): The glass is full, half way with water and half way with air. Empty (nearly): In either the liquid or the air, consider the molecules and atoms that make up the contents. The atoms are made up of sub-atomic particles such as protons, electrons, and neutrons. The size of these, in the particle sense at least, makes up only a teensy tiny fraction of the space. The protons and neutrons are tightly packed at the atoms’ cores, with the much smaller electrons buzzing around in the vast emptyness of the remainder of the territory that comprises the atoms. These account for such a small volume that the atoms (and hence the glass) is about 99.9999999999999% empty. (OK, maybe that last digit was supposed to be an 8, I’m not sure.) And that’s 0.0000000000001% full for you incurable optimists. Emptier than that: Most of the volume of the atom’s particles is found in the nucleus. But the protons and neutrons in the nucleus are made up of 3 quarks each, and the quarks are extremely tiny themselves, so that the protons and neutrons could be thought of as mostly empty space. In a sense. Emptier yet? Maybe. This emptiness may continue “all the way down.” Here’s a discussion of trying to look into quarks: click here. Full (#2): The glass is full of fields. There are electric, magnetic, gravity fields and waves everywhere inside that glass. Just lower a compass inside either the air or the water to realize this. Not recommended: lowering your iPhone in to see if its built-in compass works under water. But if you do safely float your phone inside the glass, you’ll find that you can call it, thanks to the electromagnetic waves that make their way through the glass, liquid, and air. Full (#3): The sub-atomic particles, according to quantum theories, are constantly exchanging things like photons and “bosons”. Because they like to. Kind of like playing catch, in a very small and quantumy sense. Empty and Full: Hold onto your brain. The quantum world knows of virtual particles, which come in pairs (like electrons and positrons). These tiny something-or-other pairs pop into existence and then re-combine lickety-split and go back out of existence. That keeps the quantum accountants happy. It’s worth noting that these are virtual particles in the sense that they’re not real particles, but as it turns out they’re real, too (click). Ouch. This is one of those comments that would be funny if the physicists weren’t so confident that it’s been verified to high precision. And just in time, you can get yourself a T-shirt appropriate to the topic. Any other views on the glass? Let us know. We (obviously) need help. Sources: For emptiness of the atom, see Frank Close’s Nothing: A Very Short Introduction pg. 26. For the physicist quotes, see Chad Orzel’s How to Teach Physics to Your Dog, the Virtual Particles chapter.